The Liesl + Co. Breezy Blouse is an easy-to-sew, loose-fitting, sleeveless blouse with a keyhole back opening, side panels to provide a contrast fabric option and darts for shaping. It also has separate pattern pieces for A/B, C, and D cups to enhance the fit. The pattern also eliminates side seams for a fun and unusual take on a slightly boxy top, and it has a gentle shaped hem and bias facings at the neck and arms. This is a great pattern to showcase a favourite fabric. This pattern works best with drapey woven fabrics such as silk, loosely woven cottons, double gauze, linen, rayon, and crepe. Pair two different fabrics for the front/back and side panels to make a real statement. The Liesl + Co. Gelato Blouse + Dress is a relaxed pull-on peplum blouse and A-line dress featuring a scooped neck and bust darts. 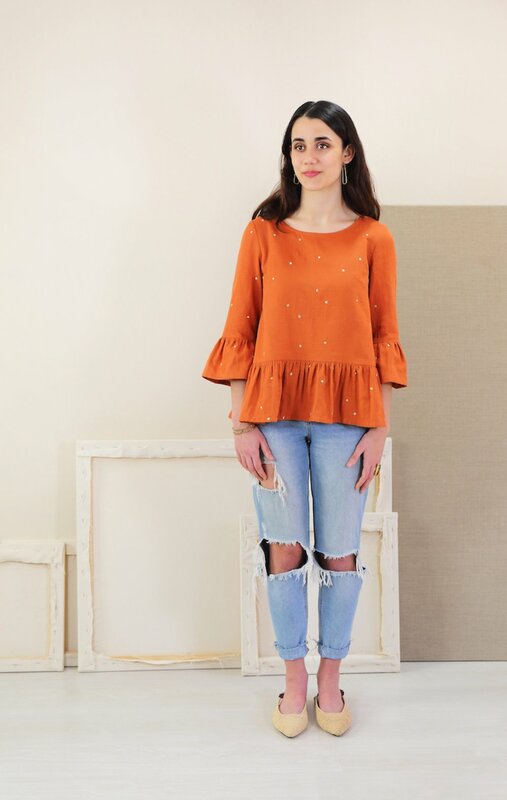 The blouse (view A) includes ruffled peplum and sleeve as well as a button-placket back detail. The A-line dress (view B) features short sleeves, double-welt angled front pockets and a centre-back seam. The pattern includes detailed instructions for doing a full bust adjustment. The Liesl + Co. Rush Hour Dress + Blouse is a lined, fitted dress and peplum blouse. The princess seams on this style allow easy customization of fit. The sleeveless dress (view A) includes a pencil skirt with back walking vent while the peplum top (view B) features choice of short or long sleeves and an asymmetrical peplum. Both styles have an invisible back zipper. The pattern includes cup sizes, a Dior dart, and instructions for customising the pattern to fit the sewist's shape. The Lucienne has a relaxed fit and has buttoning on the front and a shirt collar and rolled up sleeves. Make it as a shirt, tunic and dress, as it comes in three lengths. In a delicate see-through cotton voile, it will make the perfect cover up for a holiday in the sun. It’s simple and fast to make, and will appeal to both the experienced and beginner sewists. This sewing pattern is available in sizes 36in to 46in. The Flora is a chic blouse with a geometric yoke, which highlights an otherwise discreet low neckline. It has straight fit and long sleeves and looks feminine and has a modern edge to it. The blouse sewing pattern is ideal for adding a bit of colour to your spring/summer wardrobe and is available in sizes 36in to 46in. Comfy and casual this sewing pattern is a great wardrobe basic and perfect for showcasing a gorgeous fabric! You can make a casual top or an elegant dress with the Melrose pattern. The relaxed-fit top or dress has a wide round neckline and dolman short sleeve, and it is the perfect blank canvas to showcase some pretty fabric. The sewing pattern comes in A, B, C, D and DD cups for a better fit, and has three views so there is always a style for every occasion! Choose from wide, scoop neckline finished with bias binding, dolman short sleeves with cuffs. View A features a cinched waist and elastic through casing and in-seam pockets finish the clean look while view B has a gathered peplum. View C enables you to make it as a boxy top with bottom band. The pattern comes in sizes 00-20 and this sewing pattern has been designed for beginners. Looking for a cosy sweater? An effortless top to wear to work or perhaps you want a casual tee? Whatever you’re after, and whatever the season, the Hipi top has you covered! Hipi is a loose-fitting knit top with a subtle high-low hem, and a nod to the ‘80s with batwing-style sleeves and angled seam lines on front and back, which are perfect for playing around with print or stripe direction, or colour blocking. Mix and match with two neckline options (crew neck and scoop neck), short banded sleeves or long sleeves with a drop shoulder, and either a regular fold-under hem or a wide hem band. Make the long sleeved variation? Choose between a regular hem or wide cuffs. The pattern comes in sizes 28 - 48, which correspond to high bust sizes 28in - 48in and full bust sizes 30in - 50in. This is the perfect layering tank top for everyday wear. It is not too tight, not too loose, and just enough coverage for a regular bra. There is also included two finishing options so you can choose bands or binding. What’s good about this sewing pattern is that you need just under 1m of 75% stretch knit such as rib knit, brushed poly, cotton lycra etc. This downloadable sewing pattern is available in a good range of sizes from xxs-3xl.